Lifetime License - Not a Subscription! Logbook Pro® is the world leader in logbook software for pilots on the market serving the aviation industry over 18 years. Logbook Pro is the choice among pilots for its reputation as the most trusted, reliable, and accurate electronic flight logbook available. If there is one product you can trust with your entire aviation career as well as provide accurate details of your logbook, Logbook Pro is the answer. Logbook Pro's flight log software is flexible and customizable allowing you to add custom columns, rearrange columns, and track any data you need to record. Logbook Pro has a fully customizable currency editor allowing you to easily build currencies per your specific requirements. Advanced analysis using Logbook Pro's powerful and innovative Analyzer slices and dices your data in any way imaginable in addition to powerful filtering and pivot capabilities. Reporting is solid and professional with over 60 predefined reports including a custom report builder. Professional edition and up can also enjoy FAR 121 and 135 summary reports in addition to an invaluable AirlineApps.com Summary report breaking down your data in the complex ways to fill out their forms to get you hired. Logbook Pro Desktop is a perpetual license and not a subscription. Pay once and all version 1.x updates are free as they have been the past 18 years! Enjoy Logbook Pro in the palm of your hand or on your favorite tablet. Logbook Pro supports the widest array of mobile devices including iPhone, iPod touch, iPad, iPad mini, Android phones, Android tablets. The Logbook Pro apps are free on the various App Store's, all you need is one Logbook Pro Mobile subscription to use any and all mobile platforms. Logbook Pro Mobile syncs over the cloud effortlessly and accurately. Download a free trial and see why Logbook Pro is the most popular software logbook around. When ready to remove the 50-entry evaluation restriction simply enter a registration code and continue using the very same software, data, no reinstalls required. Technical support is free and available around the clock. Don't settle for less, make your final switch to the best flight logbook software ever - Logbook Pro! Logbook Pro comes in three editions as outlined below in the License section. Route Browser is a mapping add-in for Logbook Pro Desktop to visualize and analyze your flights. Cloud Backup: Cloud backup is an invaluable service to protect your Logbook Pro Desktop data in the event of a system failure, stolen computer, etc. With this service activated you can click File...Backup to Cloud and easily save your Logbook Pro data securely to the cloud (on our servers). Keep up to 5, 10, or 15 backups in the cloud at any time, however, you can backup as frequently as you want. The system will bump out the oldest automatically to make room for the new backup. Apps: Logbook Pro Mobile is the subscription to enable synchronization on any of our Logbook Pro Mobile apps for iOS, and Android. The Apps are free on the respective App Stores, to enable synchronization on any or all of them you simply need a low cost Logbook Pro Mobile subscription. Schedule Importer: For airline pilots this feature enables the Schedule Importer Portal and in-app schedule importing functionality. Easily convert your trip data from sources such as Crew Trac and Flica (and over 200 supported airlines/filters) into logbook data, integrate with your app's calendar automatically, export to FFDO formats, and more. Note 1: Your Apple computer must be running Microsoft Windows in its own partition (boot camp) or an emulator such as VMWare Fusion, or Parallels. Once Windows is loaded Logbook Pro can be installed within Windows and run normally. Evaluation Restrictions: There are no time limits in the evaluation of this product which is available for free download from this web site. The only limitations are the flight log area is limited to 50 flight log entries and PDA sync is disabled until both PC and PDA products are licensed. License term: Logbook Pro Desktop edition is a one time purchase, not a subscription, you are entitled to all version 1.x updates free for the life of your product. We have not charged customers for an update in over 18 years! This product is fulfilled via download from our web site. If you are already evaluating this software then a new download or install is not required as all you need to do is enter the issued registration information to lift evaluation restrictions and continue using the same software and data. Eric was very helpful with my transition into APDL and getting some of my prior 121 log book history that was not easily compatible with Desktop. He saved me a lot of time and work! Thanks for that Eric! I have been using Logbook Pro for over 15 years. My entire flying career is compiled within my Logbook Pro desktop file. When I recently had a problem opening my file, I contacted nc-software support and within 24 hours, I had a response and fix for my problem. My data has been saved thanks for the great people behind Logbook Pro. As for the program itself, I couldn't be happier with my logbook. It is more powerful than I ever imagined. I would highly recommend this software to anyone just starting out in aviation or who may have years of information they would like to compile. A great company and program. I can't say enough good about them. by Garrick D. Pattenden, ATPL. CFI. 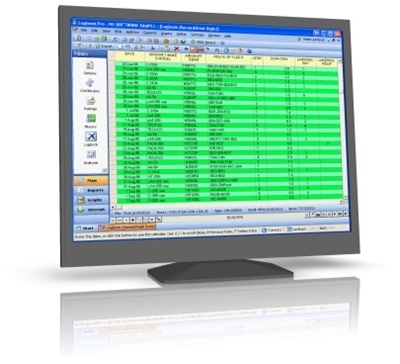 on 11/5/2014 The Best Logbook Software on the Market Today! This software is first-rate. As a software developer personally, I can really value the intricacy and specifics of this application. It could use an appearances refurbishment; however, having both assessments and numerous report categories is prodigious. Masses of immaculate features and customization are conceivable, virtually infinite. The support and video service is amazing. I endeavoured a cluster of the other software merchants; wherefore, not even precise to this product What-so-ever. This is the Best Software I have ever used! What little support I have needed in the past has been dealt with very efficiently. I do wish, though, that I could search for a partial text string in any part of a Route not just a partial string at from the start of the Route field - unless I just don't know how to do it. For example, I would like to search for a particular destination without knowing where I departed from. I have used this for several years then gave off flying for a while, during that time my PC crashed, and I had two hard drive issues. When I wanted to start back the program would not start, Eric from NC worked with me for quite some time to fix, I was not NC's issue it was a security program from Microsoft causing the problem, Eric found the issue and did not charge me for the time or aggravation I am thankful and a satisfied customer and will be for years to come.